This is a Champagne for all occasions, from “tea time” to dawn. It can be served as an aperitif, accompany grilled fish and even poultry dishes in sauce. Characters: small fruits, black currant, cherry, almond roasted, almond, nutty. Exists in half bottle and magnum. On its slopes, vine grows on soils consistituted of fragments of millstones, pebbles and sand mixed with clays of decalcification of millstones, resulting of runoff. Silts of the plate cover with a fertile coat the tops of hills, and old alluvium formed of sand, gravel and chalk pebbles. lasting properties. Stock nearly 4 years. Dosage: 6 grams per litre. Aspect: fine, lively bubbles, golden colour. 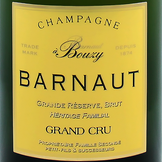 - Bouquet: intense, dried fruits, cooked apple, small red fruits. - Palate: lively, direct attack, good balance and lingering taste in the mouth. - Full-bodied. Smoked fish, fish with cream, grilled fish, fish terrines, fish in foil parcels, marinated fish, raw fish - Grilled shellfish, cassolette of shellfishes.